Native American sites are protected by law. It is illegal to remove from them any artifact of any kind. If you want to see the remains of a vanished Indian civilization, you don’t have to travel to Four Corners or the Yucatan. You can visit Volvon—the lost city in the Bay Area’s own backyard. 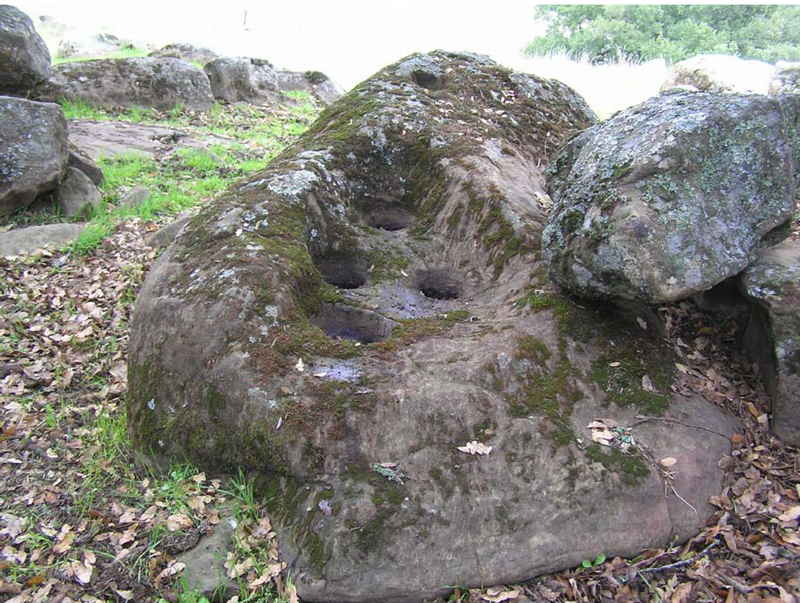 Volvon contains the largest collection of bedrock mortars in the Bay Area and one of the largest in California. Its many house pits bespeak a once sizeable population. Although these bedrock mortars and house pits may lack the grandeur of the ruins of Mesa Verde or Palenque, their antiquity is beyond question, and people lived in Volvon, more or less continuously, for thousands of years, until the Spanish missionized them at the beginning of the 19th century. When the Spanish reached the Bay Area, Volvon was occupied by a Bay Miwok tribelet of the same name. 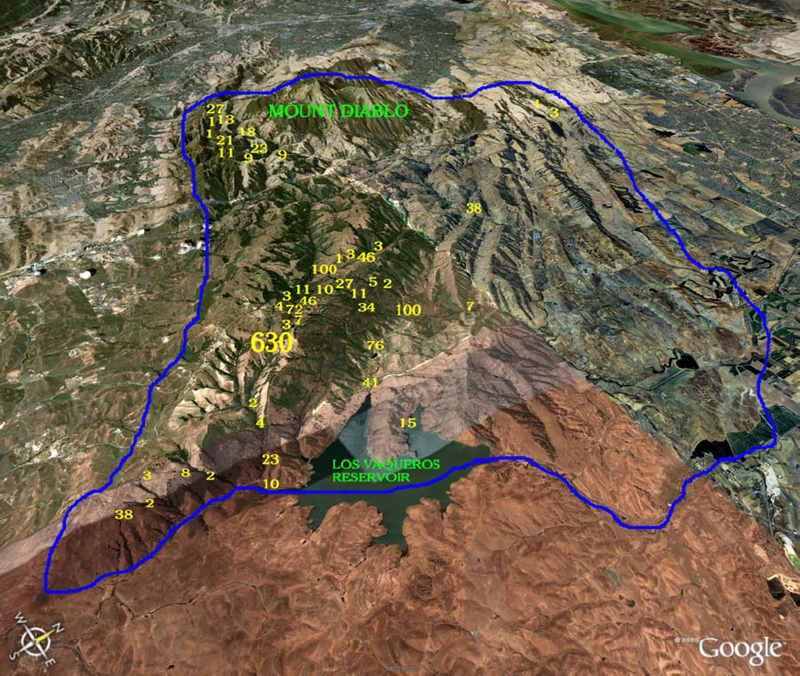 Volvons controlled Mount Diablo, which early Californios dubbed “Cerro Alto de los Bolbones ”(1)—high hill of the Volvons—as well as the adjacent Black Hills—“Sierra de los Bolbones”—which hold the entire Marsh Creek drainage as well as several tributaries of Kellogg Creek. Volvons may have settled this area as early as 5,000 years ago, when they and other speakers of Penutian (2) languages entered California fromthe Great Basin area. 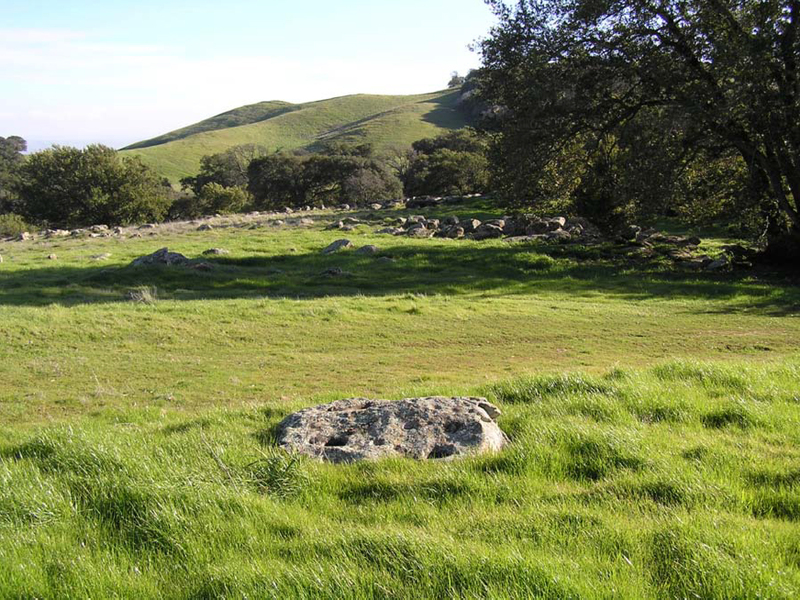 That the Volvons chose for their home the highlands around Mount Diablo, where, according to Ohlone and Miwok lore, Indian people were created and given all they needed to sustain life, may have bestowed on them a certain status in the eyes of their neighbors. Approximate boundary of Volvon territory in blue. Numbers signify bedrock mortar counts and locations. “630” denotes the lost city of Volvon. Satellite photo courtesy of Google Earth© , mapping service © 2007 Europa Technologies, Image © 2007 DigitalGlobe. Color overlay by author. Volvons were a balanophagous people—acorn eaters—and developed sophisticated milling techniques using mortar and pestle. They milled seeds and other nuts as well, often in special mortars. They managed the vast oak woodlands in their territory by careful use of fire. Fire cleared out woody understory growth and immature competitors to established oaks. Larger, older oaks yield greater quantities of acorns. Fire also increased soil fertility and encouraged germination of grasses and flowers. Hard grass seed was a major ingredient of the Volvon diet. Volvons gathered and cultivated a number of other food crops, including soap root, Brodaeia bulbs, and manzanita, toyon, and madrone berries. They also hunted deer, rabbit, and other mammals, and fished for salmon, steelhead trout, Sacramento perch, and sturgeon in Marsh and Kellogg creeks. The presence of abundant resources coupled with the labor-intensive features of acorn culture encouraged Volvons to establish permanent settlements in their territory. They exploited the local geology and located their settlements amid bedrock outcroppings near year-round sources of water. The lost city of Volvon itself is beautifully situated at the tip of a narrow highland valley 1950 feet above sea level, about eight miles southeast of Mount Diablo. Springs that feed Marsh Creek as well as the north fork of Kellogg Creek flow nearby. Steep ridges of the Black Hills protect Volvon on the northeast and southwest, and on the southeast the north fork of Kellogg Creek tumbles through a rugged canyon as it drops nearly 1500 feet in three miles to its confluence with Kellogg Creek proper. Isolated and protected in its well-watered valley high above surrounding plains, Volvon was a veritable Shangri-La in the prehistoric Bay Area. Volvon extends for a half mile and includes several neighborhoods. Its central district, perched on a shelf above the north fork of Kellogg Creek, encompasses a series of rock outcroppings holding more than 360 bedrock mortars. Although the conical willowframed and tule-thatched houses that once sheltered Volvon’s inhabitants have long since decomposed, outlines, in the form of ten- to twelve-foot diameter pits or depressions, remain. Over 60 house pits cluster around the bedrock mortars in Volvon’s central district. To the northwest, just a few yards away from the central district, over 90 bedrock mortars spread across the southeast slope of a small knoll, and five house pits nestle against the rocks. The shelf and knoll constitute the heart of Volvon—over 450 bedrock mortars and 67 house pits on a two and one-quarter acre site. The whole city contains about 630 bedrock mortars and at least 90 house pits. Central Volvon and the knoll. House pits blue. Bedrock Mortars red. Bedrock mortars not to scale. Satellite photo courtesy of Google Earth© , mapping service © 2007 Europa Technologies, Image © 2007 DigitalGlobe. Color overlay by author. Between the knoll and the central district a rock with eight bedrock mortars and 36 cupules stands by itself. Its location and the number of cupules hint at a ceremonial use. Volvon’s central district spans half the length of three parallel rock outcroppings running along the north side of the north fork of Kellogg Creek. Open areas, about 40 feet wide, separate the outcroppings. House pits line the edges of these open areas. The southernmost outcropping holds 60% of the district’s mortars, the middle outcropping 30%. A large mass of rocks, some obviously moved there purposely, covers the western end of the southernmost outcropping, above a dam that holds back a deep pond of water. If Volvon had a citadel, although there is no way of knowing whether it did, this surely was it, and I will refer to this area as the “Citadel.” The mass of rocks forms a rough enclosure for several house pits and about 50 bedrock mortars. Volvon’s first settlers probably chose this spot for their homes. A rock with five bedrock mortars ground into it sits next to a gap on the east side of the enclosure. The exposed profile of this rock indicates that it was ground down over a long time. 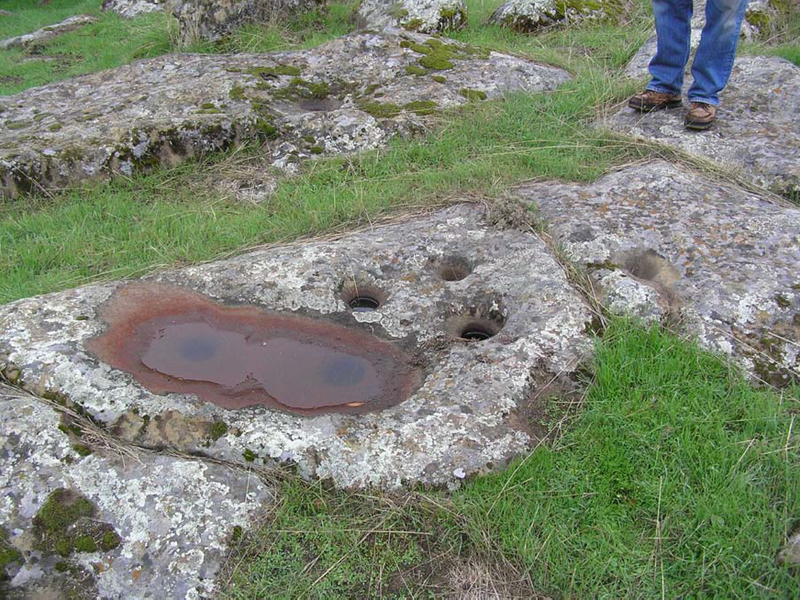 Part of the existing surface of this rock is six inches below the level of the original surface. Countless years of grinding removed three cubic feet of material. This rock testifies to Volvon’s antiquity. Throughout the central district one can find old, worn-down bedrock mortars holding smaller bedrock mortars within them, another testament to long-term human occupancy here. It seems likely that a big bay tree growing among grinding rocks in the Citadel sprouted in a communal fire pit or oven. Heavy rocks that would have surrounded the pit have been tilted almost vertical by the bay tree’s growth. Two large depressions, which lie between the Citadel and the middle rock outcropping, may once have held major structures. The highest concentration of bedrock mortars occurs immediately east of the Citadel, where the bedrock mortar to house pit ratio is quite high. Perhaps these mortars were communally used. Small open areas between the rocks may have once held acorn granaries. A granary would have been a yard or more in diameter, six to ten feet tall, and supported on posts a foot or two above the ground. Its sides would have been constructed of sticks and brush lined with grass. Laurel leaves would have been included to repel insects. The whole structure would have been lashed together and covered with a thatched cap once the granary had been filled with acorns. Farther east along this outcropping one can find examples of basket hopper bedrock mortars. The basket hoppers used here would have resembled sombreros with their tops cut off. A “sombrero” would be inverted and stuck top down into a mortar hole cut into the center of a shallow circular basin. The basin would support the sides of the basket, which would provide a clean surface to hold ground and partially ground acorn meal. One should not be deceived by the reddish color of the hopper basins. It is due to the presence of red algae and does not indicate processing of a red-colored foodstuff. The city continues another 700 feet east of the central district. It ends at a small hill overlooking the canyon formed by the north fork of Kellogg Creek. The analogy to a watchtower at the tip of a medieval hill town hardly seems forced. Some readers may object to my use of “city” to describe Volvon. In absolute terms of size it doesn’t measure up to the great cities of antiquity. But Volvon was a metropolis in prehistoric California, sheltering a population of 350-500 persons. (4) Its bedrock mortar count was surpassed by few others. In terms relative to prehistoric California life, Volvon was a city. The residents of Volvon undoubtedly lived there year-round. Some may have left the city to hunt or fish, to gather exotic foodstuffs in a relatively remote part of the homeland, or to attend trade or religious festivals, but since acorns, seeds, and the other necessities of life were abundant and ready at hand, mass seasonal migrations were unnecessary. Nor were water needs a reason for migration. Perennial springs surround Volvon. Today dams confine their waters, just as similar, though smaller, ones probably did in Volvon times. Although Volvons needed water to drink, to leach their acorns, and to prepare food, they had no showers, toilets, washing machines, or dishwashers. Their water needs were tiny compared to ours. Volvon was the principal settlement in the Volvon homeland, but not the only one. In Morgan Territory alone, five villages—along with milling stations, grinding slicks, and lookouts—exist within a narrow one and one-half square mile area north of Volvon and east of Marsh Creek. 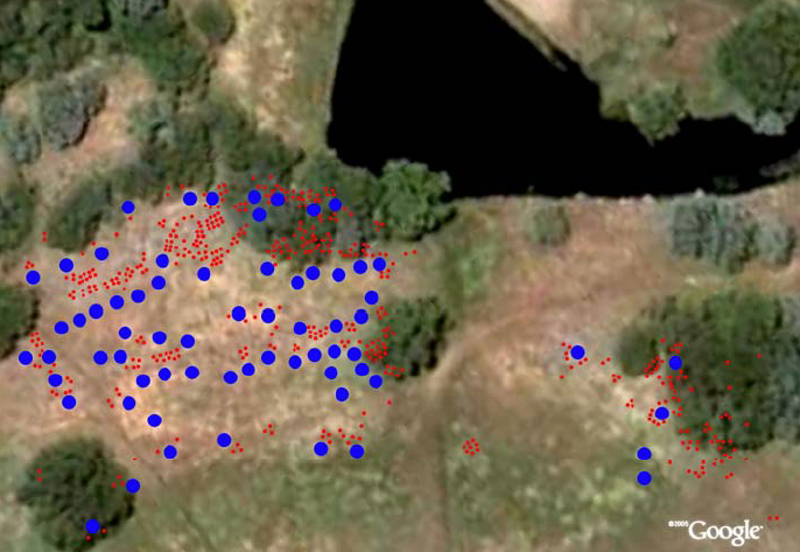 (5) Altogether these sites contain over 300 bedrock mortars. Thus nearly 1,000 exposed bedrock mortars lie in the heart of the Volvon homeland. Surely many more lurk beneath the surface. Other Volvon villages and milling stations exist at the foot of the hills in Round Valley and near Los Vaqueros Reservoir, in the vicinity of Rock City, in Curry Canyon and its environs, and along Marsh Creek. The abundance of bedrock mortars in Volvon suggests it was more densely populated than some have claimed. (6) Development has barely touched the Volvon homeland. Much of it is on public land, as are nearly all the archaeological sites. Most privately owned land along Marsh Creek and in Briones and Deer Valleys remains in a natural state. A trip to the lost city of Volvon and its environs is very much like a trip back into time. (2) A. L. Kroeber and Roland B. Dixon coined the name “Penutian” to refer to the (hypothetical) family of languages spoken by five Central California tribal “stocks”: Coastanoan (Ohlone), Miwok, Maiduan, Yokuts, and Wintuan. The “Penutian Hypothesis” was later extended by the linguist Edward Sapir to include presumed cognate languages spoken by tribes in Oregon and elsewhere. The validity of the Penutian Hypothesis is generally, but not universally, accepted by contemporary linguists. (3) E. Breck Parkman in “The Bedrock Milling Station” in The Ohlone Past and Present, Lowell John Bean ed., Ballena Press, Menlo Park, CA, 1994, proposes that the minimum bedrock mortar count for a village is 20. The knoll holds 4 and one-half times that amount. (4) Randall Milliken in A Time of Little Choice, Ballena Press, Menlo Park, CA, 1995, proposes that the small, hemispherical huts of the type that would have existed at Volvon housed between four and twenty-four persons. If, at the peak of its population density, Volvon contained 90 houses, which sheltered just five people apiece, it would have had a population of 450. Volvon’s population may have waxed and waned on a seasonal basis. Tribal members may have migrated back to Volvon from other parts of the homeland when water became scarce during late summer or fall. Volvon’s population no doubt fluctuated over the years as a function of ecological conditions. (5) These were not seasonal encampments. The farthest removed from Volvon was only about two miles away—less than an hour’s walk. Why would anyone decamp from Volvon, where there is year-round water, just to settle down again such a short distance away? (6) Randall Milliken, in “Contact-Period Lifeways” in Native American History Studies for the Los Vaqueros Project: A Synthesis, David A. Fredrickson, Suzanne B. Stewart, Grace H. Ziessing eds., Anthropological Studies Center, Rohnert Park, CA, 1997, estimates pre-contact (prior to the arrival of the Spanish) population for the whole Volvon tribal area at no more than 200 persons. This low estimate seems hard to reconcile with the density of bedrock mortars and the number of house pits in and around the city of Volvon. Milliken’s population estimate derives from mission baptismal records. Although his estimate factors in a 33% population loss due to disease, he neglects the possibility that some Volvons may have fled their homeland in the face of the Spanish onslaught. Milliken also mistakenly assumes that the Volvon homeland was “a dry land watered only by intermittent creeks and small springs.” (ibid. p. 37) A field trip to Volvon easily dispels this misconception.